This article covers how to get started with FullStory, including steps to check your privacy settings, install your snippet, and hit play for the first time. 2. You've got sessions - now what? The magic of FullStory starts the first time you hit play and see a real customer's experience in pixel-perfect playback. Privacy is a priority. Take a moment to consider, "Are there any parts of my website, online store, or web application that capture sensitive or personal data?" Some data is sensitive personal data that you would never want to send to FullStory. For example: passwords for sign-up forms or credit card details for a purchase should always be private. 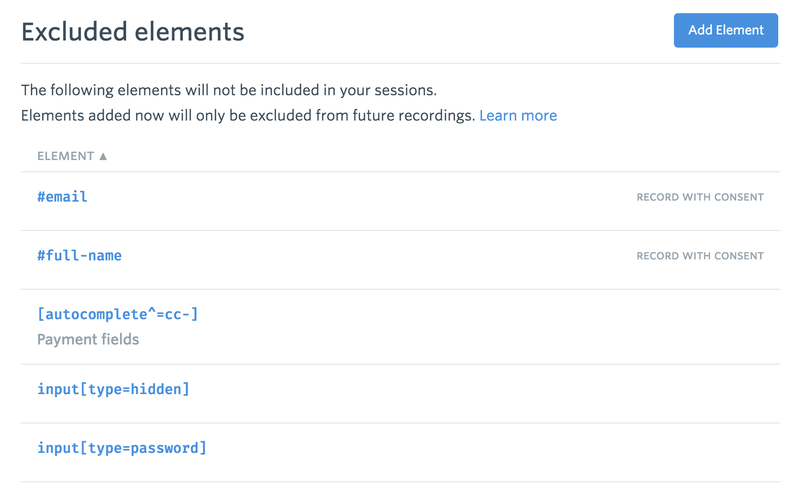 Use Excluded Elements to make sure that sensitive data doesn't get recorded at all. First, review FullStory's default exclusions carefully. Then, customize them as needed to match your website's HTML and CSS naming conventions for sensitive fields. Some personal data isn't sensitive, and you might want to record and send that personal data to FullStory with a customer's permission. For example: your customer may consent to let you record their personal name or user ID so that you can identify their sessions and provide more proactive customer support. Use FS.consent to ensure that FullStory only records personal data when your customers have given permission. Once you've customized your settings to ensure that all sensitive personal data fields are blocked and that all personal data is handled with consent, FullStory will capture everything else — all the customer experience data on sites where the snippet is installed — without any further special instrumentation. Privacy settings all buttoned up? Nice work! Gold star. Proceed to the next step. You can copy / paste the snippet into the <head> element via your Content Management System (CMS), via your online store platform, or via your application's code. Or, if you use Google Tag Manager or Segment, you can install FullStory through a tag manager integration. Go learn about how to install the FullStory snippet and complete your setup. Once you've got your FullStory snippet installed, you will start to see active visitor sessions show up in your 'Everyone' segment as new visitors interact on your site. Want to quickly test and make sure it's working? Open up your site in your own browser, click around on a few things, and then navigate away from your site in your browser. You should see your own visitor session show up in your 'Everyone' segment. With your privacy settings buttoned up and sessions recording, you're prepared to go where your imagination has already been. Ready to unlock the magic of search and playback? Move ahead to "You've got sessions - now what?"